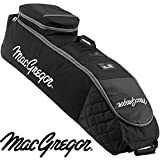 The MacGregor VIP Deluxe Wheeled Travel Cover is the best and only way to get your clubs to the destination safely and securely. Designed to be highly durable and east to transport around the MacGregor VIP Deluxe Wheeled Travel Cover really does take the hassle out of travelling with your golf clubs, Internal heavy duty anti-burst straps have been used to secure your golf clubs in place during transit, the outer zip is easy to use and the large compartment is super easy to access so putting and taking out your clubs is easy. The durable in-line skates roll smoothly across any surfaces and the top handles makes pulling extremely comfortable and when you need to carry the travel cover MacGregor have used a large padded single carry strap that is detachable when not being used.